This is a highly biased selection of books that I think are wonderful, useful, inspirational, or that I mention in my articles. Because I am always getting emails asking me where the books I review can be purchased, and to help defray the costs of maintaining this site, I have created links to affiliates where you can purchase the books online. A small commission will be paid to me if you purchase them using these links. Have a book you'd like me to review here? Let me know by using the contact form at the Code of Ethics Dog Breeders Registry, which will be forwarded to me at my email address. I have had to use this method to protect my new email address from a deluge of spam: Contact Me Here! Note: In the references section of my article on Re-vaccination, I cite two editions of Kirk's Current Veterinary Therapy, the 11th, published in 1995, and the 13th, published in 2000. The 14th Edition is being published soon, and is available for pre-order now here. Kirk's is the single most clicked-on book title on my site, but is rarely purchased as it costs around a hundred dollars. It is, however, a very valuable reference book and I highly recommend it. I also strongly recommend Plumb's Veterinary Drug Handbook. The Fifth Edition was published in early 2005 and is the most up-to-date reference on the use of drugs in veterinary medical practice. The cost is around $70. The Web That Has No Weaver: Understanding Chinese Medicine, by Ted J. Kaptchuk.I recently re-read this book for a project I'm working on. I remembered it as being good, but it's more than good. It's fantastic. I'm frequently struck with how little understanding of Traditional Chinese Medicine there is among holistic pet care people, relative to Western herbalism and even other systems such as homeopathy. My first exposure to holistic vet care was, in fact, TCM, and I don't know how I'd have dealt with some of my dogs' problems without it. This classic book on TCM is well-written, easy to read, and inspirational. Herbs for Pets, by Mary L. Wulff-Tilford and Gregory L. Tilford, is a huge, useful, interesting, well-researched book, illustrated with gorgeous full color photos, and printed on high quality, glossy stock. At first glance it seems like a coffee table book, and the quality of the design and photography reinforce that impression. However, the content is even better than the photos and design. There are literally hundreds of plant medicines included in this massive resource. Each entry includes a plant description, information on cultivating and obtaining the plant, a guide to the preparation and administration of the herb, beautiful, large, clear, color photographs of the herbs, and information on contraindications and side effects. There is easy to understand information about what common maladies can be treated by each herb contained with the description of each herb. The herb guide alone is almost 200 pages long, but the book includes more than that. An excellent encyclopedia of ailments, with practical care suggestions as well as references to appropriate herbs, follows it. There is even a comprehensive section on nutrition, utilizing the holistic approach that sets the Tilfords apart as herbalists. They cover nutrition and herbal care for many species of animals, including dogs, cats, horses, birds, and reptiles. They describe Western, ayurvedic, and Chinese herbs, and give information on how to grow many useful herbs in your own garden. The Tilfords explain different fields of complementary and alternative medicine, including acupuncture and homeopathy, and indicate which modality is useful for what conditions. Just when you thought it couldn't get any more useful comes the guide to losing animals to death and a listing of holistic veterinarians who work with herbs, as well as holistic veterinary organizations. There is even a short list of recommended commercial foods for those who aren't ready to make their pets' food themselves. If you have an interest in herbal medicine, for humans or for animals, this book will be a treasured classic and more than earn its shelf space. Its price of around forty dollars might seem steep if you haven't actually seen the book, but I have seen many books of this quality and much less usefulness for twice that amount. Homeopathic Care for Cats and Dogs: Small Doses for Small Animals by Donald Hamilton DVM. "What precisely is a 'healthy animal'?" asks holistic veterinarian Don Hamilton. "My perception of health and disease has changed considerably since I began to study and practice holistically, and particularly through homeopathy," he writes. "My veterinary education did not include a sense of how a truly healthy animal should appear. Many conditions we considered to be normal in dogs and cats I now understand to be early signs of illness.... I don't believe we know what a healthy dog or cat looks like these days. We can only speculate." Hamilton's Homeopathic Care for Cats and Dogs is unlike any other book on holistic veterinary medicine. This is not a "how-to" book. Oh, it gives hints and suggestions for treating common problems, and includes a thoughtful materia medica, but above and beyond all else this is a book about the theory and philosophy of true holistic medicine for animals. Hamilton has an amazing gift for making the most unfamiliar theories and principles both clear and accessible. Most importantly, Hamilton is interested not in showing us how to apply more "natural" Band-Aids to our pets' health problems, but encourages us to seek out ways to actually cure illness instead of suppressing it. Hamilton gives an overview of holistic theories of health and disease, and investigates, from this perspective, how diet, environment, genetics, and common practices such as vaccination affect health. Homeopathic Care includes an introduction to homeopathy, as well as chapters on the "Nature of Disease" and the "Nature of Cure." "The Nature of Disease" and his chapter on skin and ear problems are literally the best, clearest explanations I have ever read in either human or veterinary literature of how suppression works to damage the overall health of the animal. "The body attempts to keep the disease centered in organs that are not essential for life or that can take a lot of insult before becoming life-threatening," writes Hamilton. "The skin and ears fulfill this requirement nicely. Because they are affected early and can be severely damaged without major limitations to health, these organs are sort of a 'dumping ground' for chronic illness- very unsightly but not necessarily dangerous. "The importance of this is that almost all skin and ear ailments are external manifestations of internal, chronic disease and must be treated as such- not as local, isolated conditions," he concludes. There are two basic groups of people who are interested in holistic alternatives for pets: those who just want gentler treatments with fewer side effects, and those who are looking at health and illness from a truly holistic perspective. While there is much of value for the first group in Hamilton's book, it is the second group who will find themselves most satisfied by his approach. The Nature of Animal Healing By Martin Goldstein, DVM. 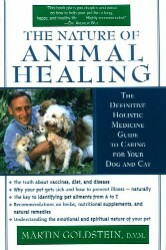 I confess to being tired of books on holistic pet health that aren't much more than recipes and prescriptions. Use this herb for that ailment, this series of homeopathic remedies to prevent that condition, this diet to heal a disease. Martin Goldstein, DVM's The Nature of Animal Healing is more of a treatise on the concepts and philosophies behind natural health than a "how to" book. Goldstein is particularly strong on cancer, and his account of his research into various holistic and conventional cancer treatment modalities is both fascinating and useful. Particularly fascinating was his "enlightenment" about the true nature of holistic healing, during the treatment of a poodle with a life-threatening tumor. Having failed with all conventional therapies, the distraught owners brought their dog to Dr. Goldstein and his brother, with whom he shared a practice at the time. Newly involved with an experimental alternative cancer therapy, the brothers rejoiced as each day the tumor got smaller and smaller. Day six, smaller. Day seven, smaller yet. They were busy congratulating themselves, until day eight, when the dog died. It's possible, Goldstein realized, to have a smaller, or even disappeared, tumor, and a dead animal. The book contains a section on the spiritual component of animal life, an extensive encyclopedia of animal diseases and conditions, information on diet, vaccines, and when to use conventional therapies. It is liberally peppered with the stories of the dogs Dr. Goldstein has treated, both his successes and failures. Goldstein writes with a warm personal style and a strong sense of conviction. For those interested in holistic alternatives, The Nature of Animal Healing will be an important reference book as well as provide food for thought. For those just beginning to explore, the book could prove inspirational or dogmatic, depending on your viewpoint. 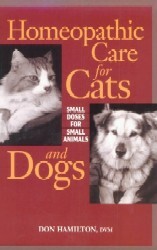 It's an enjoyable read either way, and contains much information that will be of use to the caring pet owner. 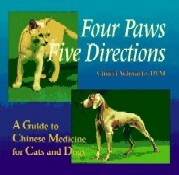 Four Paws, Five Directions: A Guide to Chinese Medicine for Cats and Dogs by Cheryl Schwartz DVM. While most people are relatively familiar with acupuncture, knowledge about Traditional Chinese Medicine (TCM) is not as widespread. Possessing its own system of diagnosis, nutrition, herbalism, and therapy, TCM is the oldest form of medicine being practiced on the planet. Its thousands of years in existence put the couple of hundred of western medicine in the shade. Cheryl Schwartz is a California veterinarian who has been practicing TCM on dogs, cats, horses, and other companion animals for more than fifteen years. She is one of the authors of the leading veterinary text on animal acupuncture, and has been invited to address both conventional and holistic veterinary conventions, both in the US and abroad. She was also, until her recent move to Southern California, my vet. My first exposure to acupuncture for pets was on my dog, Colleen. Colleen was a mixed breed dog I adopted from the shelter many years ago, who had a number of health problems. One of these was hip dysplasia, a crippling disorder of the hip joint. The first time I took Colleen into Cheryl's office, she went in on three legs and walked out on four. I learned that regular acupuncture treatments kept Colleen limber and active. Schwartz's book goes well beyond acupuncture, however. It covers the history and philosophy of Chinese medicine, presenting the underlying principles, and their application to animals. 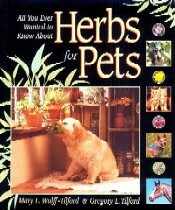 The book covers basic nutrition for pets, as well as the therapeutic uses of various foods and herbs. The sections on specific medical conditions include both Western and Chinese diagnostic categories, and list herbs, acupuncture/acupressure points, and food therapies that are often used in treating these conditions. The information is well organized and comprehensive, and includes an excellent section on cancer. Schwartz's book does an excellent job of easing the newcomer into a new way of seeing health and disease. Her approach is truly holistic; that is, she sees and treats the whole animal, not just the disease that the animal may be presenting. By integrating the philosophy, and explaining the principles behind the diagnostic system, she illuminates an area often left dark by conventional medicine. Give Your Dog a Bone and Grow Your Pups with Bones by Dr. Ian Billinghurst. Dr. Billinghurst is an Australian vet and the originator of the so-called "BARF" diet... Bones and Raw Foods, or Biologically Appropriate Raw Foods. GYDAB is more theoretical and the feeding plan more general. Grow Your Pups has very precise recipes and also contains information very valuable for breeders following his methods. Despite the title, it's not just for breeders, and contains information on how to raise a puppy as well as feed adult dogs. Also of interest: Dr. Billinghurst's newest book, The BARF Diet, is said to be even easier to follow and contain information on feeding cats. I have not read this book. And fellow Aussie vet Dr. Tom Lonsdale has come out with an interesting book called Raw Meaty Bones, definitely worth the read! Home Prepared Dog and Cat Diets: The Healthful Alternative by Donald Strombeck DVM Ph.D. I don't follow these diets, and don't agree with everything Dr. Strombeck has to say. This book, though, is an invaluable resource on nutrition, the canine and feline digestive system, and diets for specific diseases and conditions. His expose on commercial foods is top notch. Dr. Strombeck is not a holistic vet, and is a professor of gastroenterology and the author of the definitive textbook on the subject, Strombeck's Small Animal Gastroenterology. High credibility with conventional vets and a great alternative for those who want to make their own pet food but don't want to go raw. 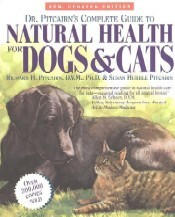 The Complete Herbal Handbook for the Dog and Cat by Juliette de Bairacli Levy. The grande doyenne of naturally raising dogs and cats, Levy has been feeding raw diets to her animals for well over 50 years. A bit hard to follow, but well worth reading and owning. Very inspirational and a "must" for breeders. The New Natural Cat: A Complete Guide for Finicky Owners by Anitra Frazier and Norma Eckroate. Fantastic book for cats, and includes home-prepared cooked and raw diets, diets using baby food, how to supplement commercial diets, and grooming and veterinary information. For cats only. I'd love to see an updated edition of this book, which was published in 1990. 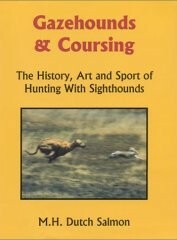 Gazehounds & Coursing: The History, Art and Sport of Hunting With Sighthounds by M H Dutch Salmon. This is the best book about what sighthounds are all about that has ever been written. I realize that hunting live game with dogs is hugely controversial and that many, perhaps most, sighthound owners would never even consider doing it. No matter how you feel about hunting, if you own a deerhound or other sighthound, read this book for the understanding it will give you of what your dog is all about. Dutch Salmon is held in high esteem as a dog man, and my own contribution to that respect will be just a drop in the bucket, but I have to add that I couldn't help but revere a guy who writes, as he does, about my breed, "I like the Scottish Deerhound best of all the gazehounds. They are a fine pet; the ideal companion dog - quiet, but alert, devoted and loving but not sloppy about it. Courageous but not overly aggressive, either with people or other dogs; dignified but not snobbish. The deerhound is definitely not temperamental. This beautiful hound has a look in his eyes you won't forget; a distant look, until he knows you." Gazehounds: The Search for Truth by Constance O. Miller. This classic book is based on a series of articles the author wrote for Gazehound Magazine from 1976 to 1980. Don't let the dates fool you, though; it is as vital and interesting today as it was when she first penned it. The origin of Gazehounds: The Search for Truth was Constance Miller's diatribe against what she perceived as lies, myths, and distortions about the origins of the sighthound breeds. While debunking myths may have been Miller's original goal, she ended up creating a fascinating history of sighthounds, liberally illustrated with photographs and illustrations. She discusses the revival of the Irish Wolfhound, the state of the modern Saluki, the history and creation of the Whippet, and how the Deerhound and Borzoi became show dogs. Her chapter on the Afghan hound, and its divergence from the Saluki, evokes an era of dog showing and breeding that few of us today can imagine. In addition, Miller delves deeply into the features of sighthound gait, conformation, and function, and those chapters, as well as the pictorial records of some of the most famous dogs of all time, are worth the price of the book alone. At the end of the book is a cartoon depicting the evolution of the Saluki. Those who admire this graceful dog and who have never seen the cartoon might find those four pages worth the price, too. No serious sighthound fancier, whether interested in showing, breeding, judging, or coursing their hounds, should overlook this book. Hoflin Press has kept it in print since 1988, and it has earned its status as a "classic" many times over. Mother Knows Best: The Natural Way to Train Your Dog by Carol Lea Benjamin. My dog training bible. I won't lie and tell you my dogs are obedience champions or anything, but the principles in this book form the core of how I believe dogs and puppies should be raised and trained. Benjamin is also the author of some of my favorite dog mysteries, featuring Dash, the pit bull sleuth! 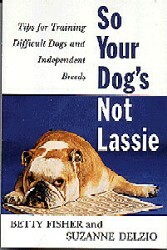 So Your Dog's Not Lassie: Tips for Training Difficult Dogs and Independent Breeds by Betty Fisher and Suzanne Delzio. Not even the cynical bulldog on the cover of So Your Dog's Not Lassie can match the expression on the face of one of my Deerhounds when I ask her to do something she doesn't care to do. It's a combination of disdain that I would be so foolish as to ask, a bit of offense that I would see her as being servile, and just a tiny bit of amused affection, her way of saying, "Will these humans never learn?" The book covers the basics of dog training, and the simple, effective, humane tools Fisher describes are excellent for the raising and training of all dogs and puppies, from the most dominant and independent to the proverbial Lassie. She teaches dog owners how to train their dogs to walk quietly on the leash, come when called, and the most important lesson of all: how to pay attention. While some trainers scorn the use of food, I am not one of them. The problem is, most of my Deerhounds do. If the way to your dog's brain is not through his or her stomach, some of Fisher's tips will be less than effective. A real plus to Fisher's approach is that it can work with anyone's schedule. Since most independent dogs are easily bored, she recommends working no more than five minutes a day on basic obedience. Even competition training doesn't involve the repetition and drilling many programs call for; if your dog does the exercise once, she says, quit while you're ahead. Most of us aren't looking for pointers on putting obedience titles on our independent and difficult dogs. We're willing to forgo the experience of having our dogs hang on our every word, breathlessly awaiting our next command. Most of us would settle for some vague acknowledgement that our dog has not gone totally deaf or forgotten his or her name when we call out, "(Not)Lassie, Come Home!" With this in mind, I found Fisher's techniques for getting your dog's attention to be the most valuable tools in the book. Utilizing games, food rewards, tone of voice, body language, and the element of surprise, she shows the owner of the dog with his or her own agenda how to get an appointment on their busy schedule. Her method for teaching your dog to make eye contact has worked well with my sighthounds, and gives me hope that before I go to my grave, one of them might actually start to demonstrate a reliable recall. We live in hope. I was in the Georgia swamps, tracking a missing child through the snake-infested Okefenokee. Sweat poured down my back under my protective gear. Bugs bit at my exposed flesh. My bloodhound's leash was gripped fiercely in my hand, as we crawled and crouched and slithered through the brush. Was my dog on the track? Would we be in time? Would he start baying in joy as we approached a lost and confused child, or would it be too late? "Would you like anything else?" I looked up from my book, dazed. I wasn't in Georgia at all. I was sitting in a restaurant, lost in one of Virginia Lanier's bloodhound mysteries. To the surprise of many, dog mysteries are extremely popular within the mystery field, and even among those who don�t read any other type of mystery book. In addition to Lanier's bloodhounds, Susan Conant's Alaskan Malamutes Kimi and Rowdy have solved many a crime with their partner, dog writer Holly Winter. Carol Lea Benjamin is best known for her series of books on dog training, but is the author also of a series of mysteries featuring slick private investigator Rachel Alexander and her pit bull, Dash. A cheerful Standard Poodle named Faith accompanies Melanie Travis while she investigates murders in her quiet suburban neighborhood in Laurien Berenson's mystery series. Read more here.